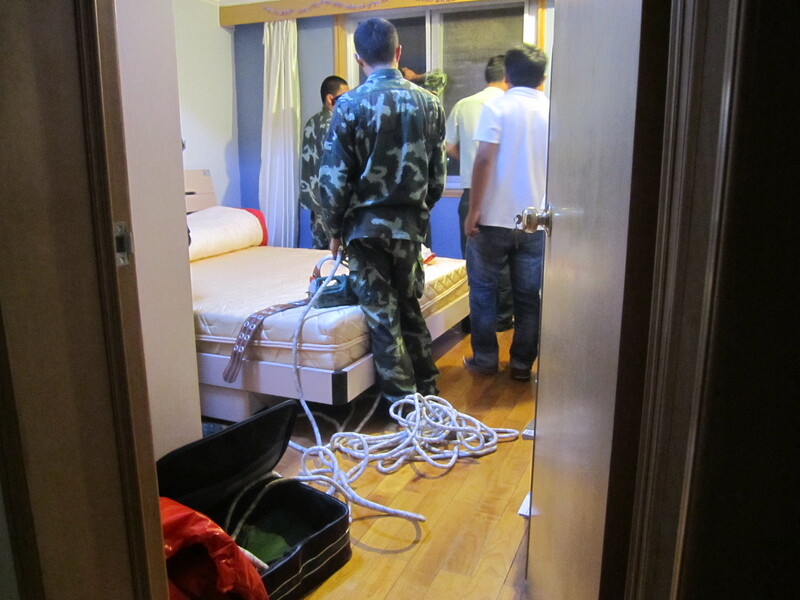 To my surprise, at about 9:15, I answered the door, and in stampeded five men in army fatigues, one guy with a walkie talkie who seemed to be in charge, and our rental agent. The next door neighbors came over to see what was happening as well. The guys walked straight back to my room where they prepared for attack. Inside a small suitcase they had a long rope, some bug spray, a large, plastic rice sack, and some mosquito netting. They prepared their weapons of choice, while asking questions about how long it had been there etc. (Answer: I have no idea, I just moved in.). One guy had a video camera, recording every second of the action. They tried to open both sides of the window, but because of the way that the nest was attached, the windows were both jammed shut. Time for Plan B. Two dudes were sent down to their car to get more materials, while the others remained up in the room, posing in front of the nest and taking pictures with their cellphones. I asked if they saw wasp nests this big, and they said yes, and that sometimes they are even bigger! Hmm.... what do we do now? 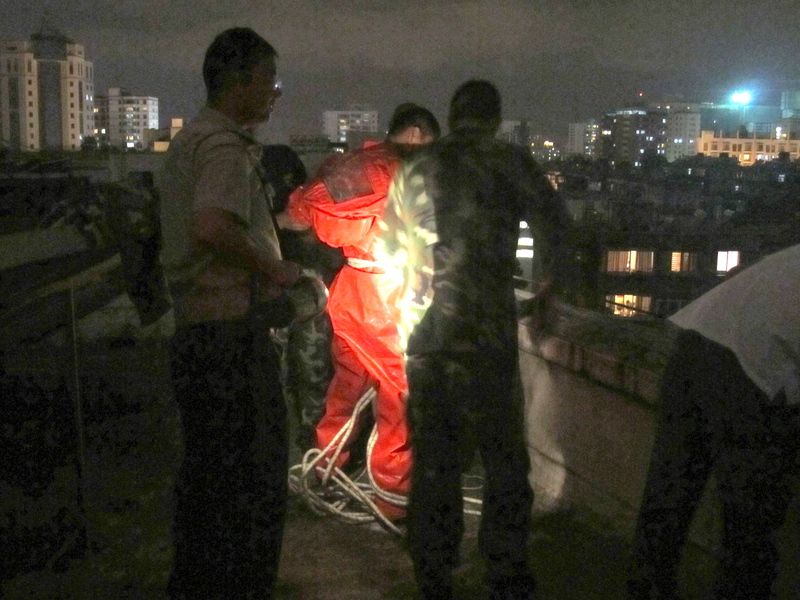 Luckily, we live on the top floor of our building, and the next door neighbor had a key to get onto the roof. The team then assembled on the roof, strategizing how to lower one guy down to get the nest. They argued for about 10-15 minutes about where to tie the rope, and whether or not they had all of the necessary materials to accomplish the task now. It was during this time when the man in charge got a call on his cellphone. His ringtone- Taylor Swift’s Love Story. You can’t make this stuff up. I had to laugh. 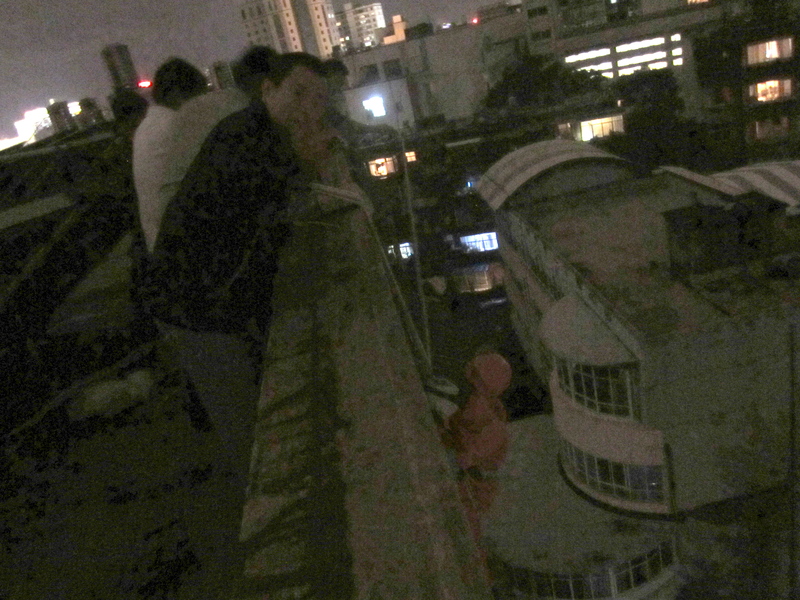 I was enjoying the rooftop view and trying to document the experience, when one guy stripped out of his army getup and into a red hazmat suit. They made him a harness out of the rope, attached the rope in several strategic places, and made another rope to lower down the wasp spray. It seemed like they had done this before. 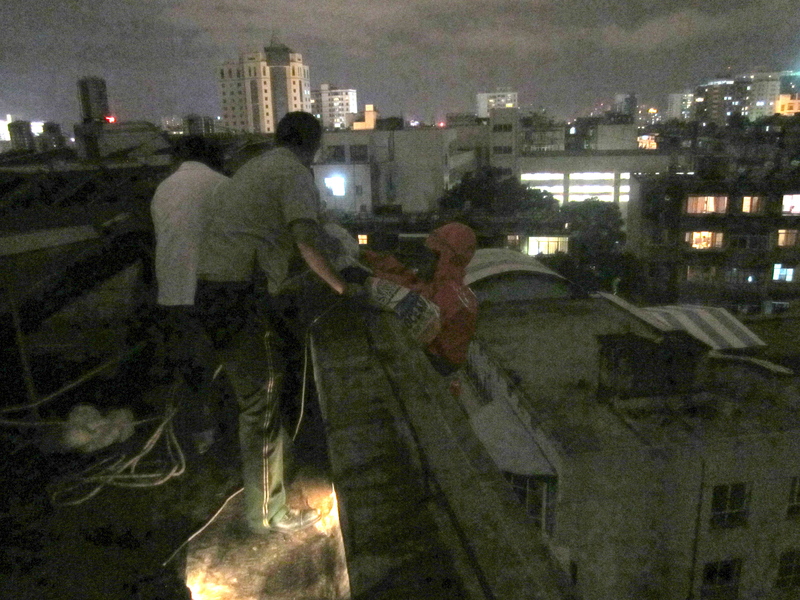 They zipped him in his suit, complete with rain boots and thick gloves, and then he crawled over the edge. I watched for a minute, but as he got his footing on the windowsill and began hacking away at the nest, I decided to run for cover indoors. Jess and I watched from indoors, where he hacked off huge chunks of the nest using a putty knife and put them in the rice bag. 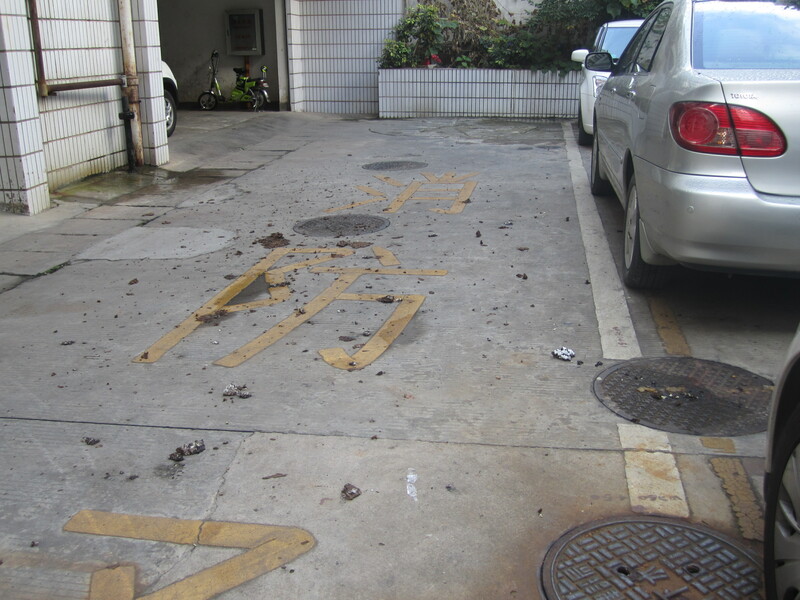 For every huge chunk that he was able to get in the bag, it seemed that another equally sized chunk fell eight floors below to our apartment’s parking lot. After a few minutes of attack, he was ready to come in, so the guy in charge opened my bedroom window and he climbed in to safety. A few stragglers buzzing around my room were sprayed and killed, and the guys packed up their stuff. The team packed up and left in a blink. We hardly had a chance to thank them. The remnants on my window. I celebrated by sleeping with the cool wind blowing through my newly opened screen. It felt great! But then I woke up this morning to an audible buzzing outside. The wasps were back- angry and confused about where their home went. 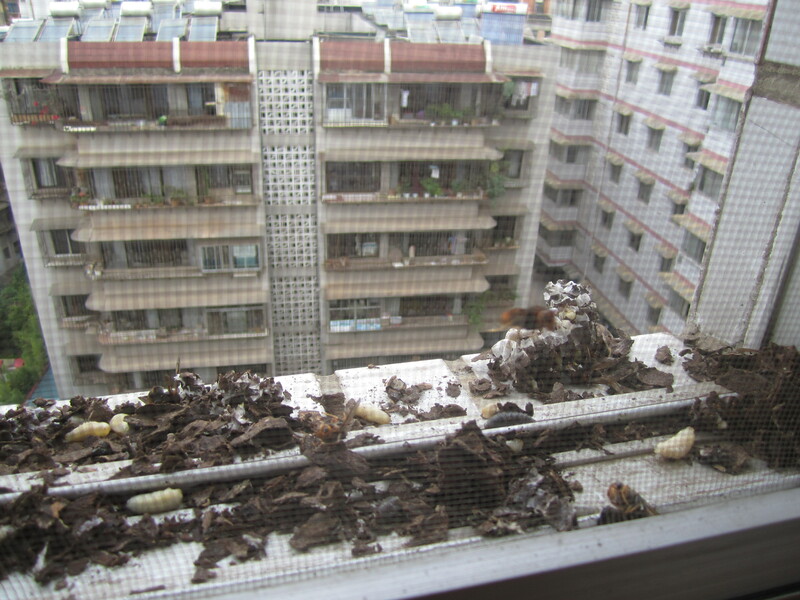 Jess said they were swarming around her window too. 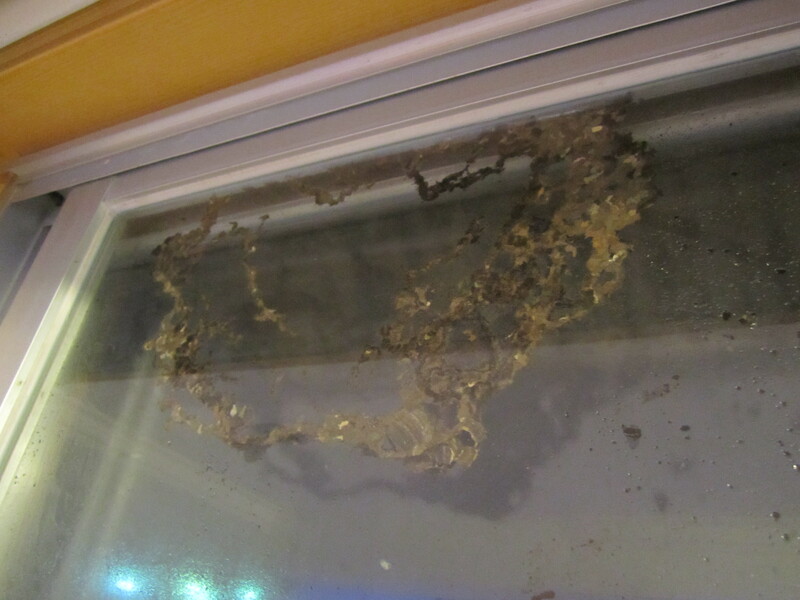 There is still a decent chunk of their nest attached above my window. I think I’ll have to invest in some wasp spray and give it a good dousing at least once a day for the next few days and hope that they go away. This wasn’t the way I had originally intended to spend my Friday night, but it was an exciting end to my second week in Kunming. Reading your email was a great way to enjoy a Sat. morning break from cleaning. It was a wonderful story with great photos. I do hope you keep control of the situation. I don’t know that a second visit would be as much fun. What a Kunming welcome for Kimfuscius! I’d keep the spray handy for more than a few days, winter’s coming. What a great story! And the pictures are perfect. You should send it to UVA’s Alumni News. Maybe co-op “mib’s” comment as the title.